Field Home exterior, circa 1941. Image courtesy of the City of Edmonton Archives EA-160-896. In Edmonton’s early years, milled lumber was in short supply, and so dwellings were often constructed using logs. Early European settlers, along with newcomers from Ontario and the United States, built homes using horizontal log construction with vertical bearing walls and notched corners. “Since most settlers needed the most practical shelter possible due to limited time, capital, and technical skills, they used horizontal log construction that made use of locally available timber,” wrote Donald G. Weatherell and Irene R.A. Kmet in their book Homes in Alberta. The early 1880s were the heyday for log construction in the region, when most of the homes around Edmonton and Calgary were built that way. John Walter, a boatbuilder from Scotland’s Orkney Islands, was 21 years old when he arrived in Edmonton in 1870. He built boats, established a ferry service, two lumber mills, a coal mine operation, a general store, a carriage service and numerous wood-related industries and became Edmonton’s first millionaire. Walter saved enough money working as a boat builder for the Hudson’s Bay Company to buy River Lot Nine, which extends from 107 Street west to 109 Street and from the bank of the North Saskatchewan River south to University Avenue. In 1875, he built a house – the first to be constructed on the south side of the river – of logs from Whitemud Creek and Big Island. For four months, the house was Edmonton’s first telegraph office, headquarters for the ferry captain and a stopping house for travellers. There was even a small general store. During the Northwest Rebellion of 1885, it was used as a refuge. He built another log house in 1886 and then a wood framed structure in 1900. Today the three houses are part of the John Walter Museum at 10633 93 Avenue (adjacent to Kinsmen Park, just west of the Walterdale Bridge). Field House – living room interior, December 1934. Image courtesy of the City of Edmonton Archives EA-160-811. Made from 20-centimetre-thick logs cut from jack pines near Pigeon lake, this one-storey Highlands-area residence was custom built in 1934 by Stuart Olson for Alfred and Marguerite Field. It took a crew of four men four months to complete the job, overseen by a Swedish carpenter who built some of Canadian National Railway’s log buildings around Jasper. The Fields paid $4,500 for the custom-built home, with horizontal log construction with vertical log corners, decorative log supports and wood-framed windows. In a neighbourhood of stucco and wood-frame homes, its rustic touches like decorative logs in the front gable and a large fieldstone chimney, made it an instant landmark. Mr. Field found the “design, warmth and quality of a custom-built log cabin very appealing,” reported a 1978 article in the Edmonton Journal. He owned and operated Field’s Service Station at 12803 Fort Road from 1935 to 1946, and then at 12723 Fort Road from 1947 to 1956. They lived in the home for more than 50 years. On a fabulous perch overlooking the North Saskatchewan River valley, labourer and contractor Frank G. Newton built a log cabin in 1935. Newton used logs from Pigeon Lake, laid atop a concrete foundation. He notched log columns to frame the entry porch and hauled fieldstone from miles around to build a fireplace, vented out through a stone chimney. Over its life, the cabin at 9905 115 Street has been a cozy home for several prominent Edmontonians. Its first occupant was Fred Norris, a manager for Imperial Oil. A couple of years later, the house was the home of James A. MacArthur, general manager of Northern Alberta Railways. He moved out sometime during World War II and then the cabin was occupied by T.S. Sutherland, assistant manager of Johnstone Walker’s department store. With its panoramic view over the Victoria Golf Course and up and down the valley, it’s a resting place that has understandably attracted artists and creators. They’ve included actor and drama professor Gordon Peacock and publisher and politician Mel Hurtig, founder of Hurtig books and the father of the Canadian Encyclopedia. Hurtig moved into the house in 1987 and filled it to the rafters with books and papers. His working space overlooked the river valley, and he often said it was his sanctuary. Hurtig lived in it until 2005, when he moved to Vancouver. Northern Alberta Pioneers & Descendants Association Cabin, circa 2006. Image courtesy of the City of Edmonton Archives EA-792-337. Constructed of spruce logs harvested from a stand near the Pembina River at the Drayton Valley bridge, the Old Timers cabin at 9430 Scona Road was completed in 1959. 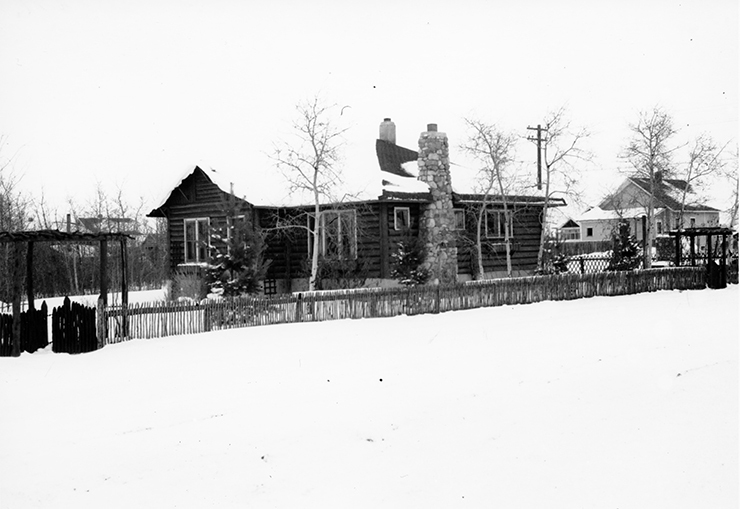 The organization that built it, the Northern Alberta Pioneers and Descendants Association, also built a log cabin called The Roost on the Edmonton Exhibition Grounds in 1926. The cabin on Scona Road was designed and constructed by Hobart Dowler, who built nearly 100 stone and log structures in Alberta including the replica stockade and blockhouses at Fort Macleod. Dowler and his crew of 10 hauled the spruce logs to his property near Mission Beach on Pigeon Lake and saddle-notched them with an axe to form a tight weatherproof fit without the aid of chinking or plaster. Each log was then numbered before being dismantled and hauled to Edmonton. Once at the Scona Road site, the logs were reassembled atop a stone-faced basement foundation. The cabin was declared a Municipal Historic Resource in 2011.